Turkmenistan's cuisine is very similar to that of other Central Asian countries (especially Iranian) and predominantly comprises rice and vegetables, and of course various meats (mutton, lamb, beef and poultry). Meals often begin with soup. A popular soup is chorba, meat and vegetable soup. Plov is also a national dish. It's basically a rice dish, served with mutton, onions, carrots, spices, raisins, peas or quinces mixed all together. Poultry is sometimes used instead of mutton. Manty are small dumplings, filled with lamb and steamed. 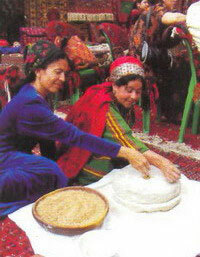 Ku'urma is lamb cooked in its own fat; ichlekli - meat and onion pies, cooked in hot sand. Gutap is a type of pie, filled with meat, potatoes, spinach or pumpkin.